The RosabelTM 5-bottle wine rack is designed and sold exclusively by KitchenEdge. Please note: Wine bottles are not included with purchase. By KitchenEdge - Innovative design. Superior quality. SATISFACTION GUARANTEE: If you are not satisfied with your purchase, just return it within 30 days for a full refund. No questions asked, no hassle. MANUFACTURER WARRANTY: We are so confident in the craftsmanship of this product that we offer a 6-month warranty against manufacturing defects. Measurements: 8.25" (21cm) wide, 15" (38cm) tall, 6" (15.2cm) deep front to back. No assembly required. Free standing. BEAUTIFUL DESIGN: The RosabelTM wine rack has an elegant French grapevine design with hinged handle on top to compliment your décor. 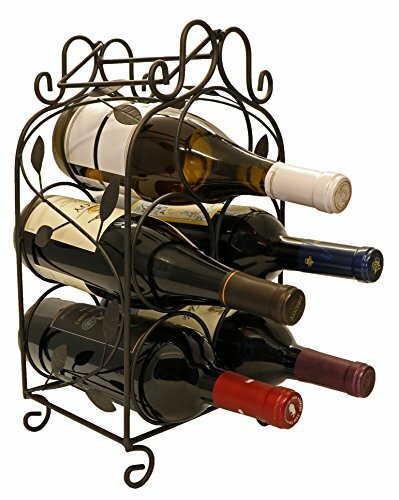 HOLDS FIVE (5) 750mL WINE BOTTLES: The RosabelTM wine rack is designed to hold five (5) 750mL wine bottles up to 3.5" in diameter, including large-diameter Chardonnay bottles. STURDY CONSTRUCTION: The RosabelTM wine rack is made with high quality iron wire specially treated with an anti-rust matte black metallic finish. THE PERFECT GIFT: The RosabelTM 5-bottle wine rack comes packaged in a beautiful gift box. It's the perfect gift for weddings, anniversaries, holidays and other special occasions. If you have any questions about this product by KitchenEdge, contact us by completing and submitting the form below. If you are looking for a specif part number, please include it with your message.